There are several foreign schools in Busan which offer pre-school, elementary and secondary education in English. Most of them have standards that are equal to or surpass those of American public and private schools, and most are fully accredited by at least one U. S. agency. The educational philosophies, facilities, student - teacher ratios, and conditions vary among schools, so visits to each of them are advisable. For children whose English language skills are inadequate, some schools provide ESL classes, but they may have limitations as to entrance and completion periods. Check well in advance because they may only accept a limited number of students. Facilities: classrooms, purpose-built rooms, multi-purpose auditorium, cafeteria, gym, soccer field, etc. Busan Foreign School, fully certified by WASC (Western Association of Schools and Colleges), serves international families from Pre K-3 to 12th grade. We are a small school and strive to maintain a small school feel. Most class sizes range from 15-20 students, and our early childhood program has even smaller class sizes to ensure quality learning. Over 95% of the teaching staff are either US or Canadian certified teachers, and all staff and administrators are trained in the most current research of best educational practices. The Common Core curriculum and other U.S. based national standards guide all classroom instruction. Staff members are required to professionally develop their skills. At the secondary level they apply their training in teaching rigorous Advanced Placement courses in the Maths, Sciences, English, Humanities, Languages, and the Arts. Busan Foreign School was accepted in 2016 year to the AP Capstone Program, becoming the third school in Korea administering this Diploma. At the elementary level, we have implemented the highly regarded and respected Singapore Math curriculum. School-wide we subscribe to the Readers' and Writers' Workshop model to hone English literacy skills. 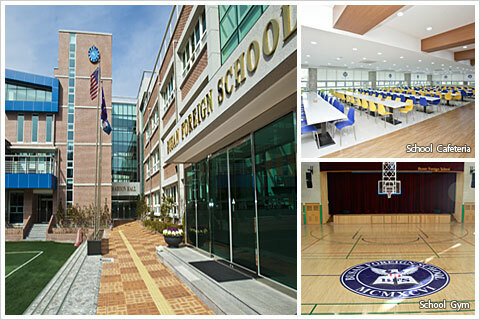 Busan Foreign School strives to offer a balanced program of academics, athletics, and arts. We believe that both academic and nonacademic life are equally important and help to shape our students into model citizens of the world. BFS competes in the Southern Korea Athletic Conference (SKAC) with several other schools in the region in both sports and non-athletic annual events such as Speech and Debate, Science Fairs, and an Arts Festival. Furthermore we encourage and support students to participate internationally in reputable competitions such as the National Honor Society, Yale-NUS model United Nations or the Scripps National Spelling Bee, to name a few. 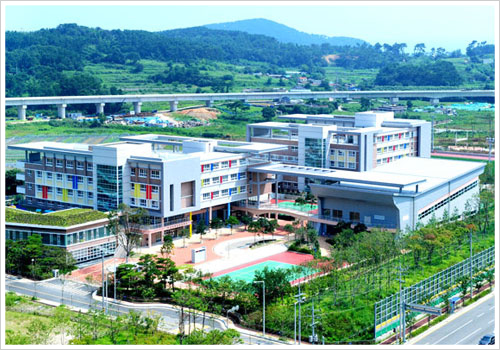 With a new building and grounds as of the fall of 2013 - including a STEAM (science, technology, engineering, arts, and mathematics) tower - Busan Foreign School is committed to continuing its strong tradition of providing a nurturing, yet rigorous, academic experience for all learners. BFS is a member of ISS, Search Associates, KORCOS, EARCOS, NHS, NJHS, and the National Association of Student Councils. Location : New Haeundae, nearby Jangsan Park. Facilities : Outdoors play areas, Indoor Gym, Library,Auditorium(s), Lab, Art & Music rooms. University Acceptances:Year after year BFS graduates are accepted to and receive scholarships from universities all over the world, many of which rank as top tier such as Johns Hopkins, Cornell University, Berkeley, UCLA, Washington University in St. Louis, University of Toronto, Rice University, Emory University, University of Hong Kong and the University of Virginia just to name a few.